Young leaders from more than 20 countries participated in the orientation training on "South-South & Triangular Cooperation in Implementing the 2030 Agenda: Youth4South Edition", which took place in Istanbul on 20-22 June 2018. 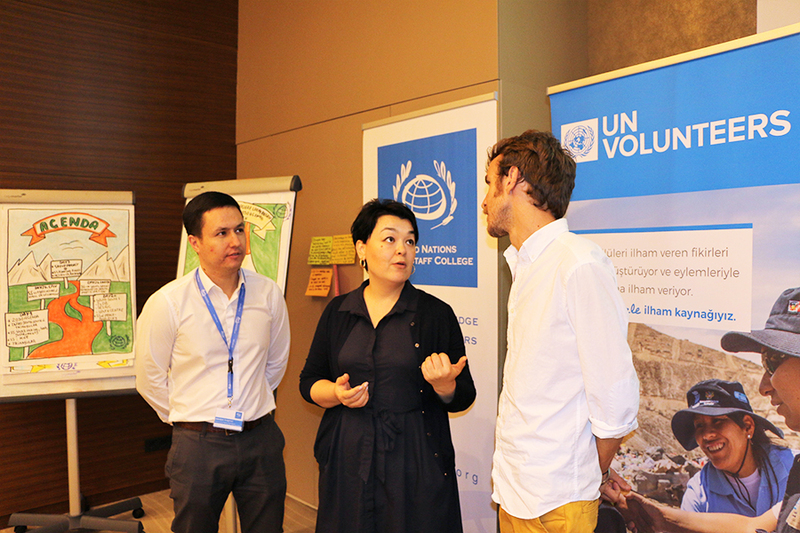 UN Volunteers Jasurjon Ibragimov (Uzbekistan, left), Kanykei Ergesheva (Kyrgyzstan, centre) and Luis Espuny (Spain) at the first Youth for South Advanced Young Leadership Programme orientation training in Istanbul, Turkey. The "Youth for South (Y4S): Advanced Young Leadership Programme" was launched by the United Nations Office for South-South Cooperation (UNOSSC) last year during the Global South-South Development Expo in Antalya, Turkey. The training, bearing the title "UN Catalytic Support to South-South and Triangular Cooperation in Implementing the Agenda 2030", allowed participants to learn, exchange views and apply South-South and Triangular cooperation tools and methods in scaling-up sustainable development solutions in their home countries and communities. We aim to equip established young leaders from various parts of the globe with tools and methods of South-South & Triangular Cooperation, and provide some seed resources and access to our networks, to support their effort in scaling up innovative solutions in promoting sustainable development. --Dingding Sun, Programme Specialist at the UN Office for South-South Cooperation, coordinating the Youth for South programme. This summer, the pilot orientation training will cover two thematic areas, namely agriculture and rural development, and reproductive health. The training was co-led by the United Nations Volunteers (UNV) programme, China Institute for South-South Cooperation in Agriculture (CISSCA), United Nations Population FUnd (UNFPA), Islamic Development Bank (IDB), Statistical, Economic and Social Research and Training Centre for Islamic Countries (SESRIC), and other institutional partners. Kanykei Ergesheva (Kyrgyzstan), a UN Volunteer working with UNOSSC, was actively involved in the development of the Y4S programme and supported the organization of the orientation training. Additionally, two UN Volunteers took part in this event: Luis Espuny, UN Volunteer with the Office of the HIgh Commissioner for Human Rights (OHCHR) in Guatemala, and Jasurjon Ibragimov, a UN Volunteer serving with the UNDP project, "Developing climate resilience of farming communities in the drought-prone parts of Uzbekistan". UNV is proud to provide support for this multi-agency initiative and hopes more UN Volunteers will be empowered to bring transformational change by promoting the adoption and implementation of South-South solutions through the Youth4South programme.